Transmitter is pleased to present Stop Making Sense, a collaborative project in which all six Transmitter co-directors selected one work by an artist who remained unknown to the rest of group until the day of installation. This exhibition turns conventional curatorial practice upside down and seeks to deconstruct the traditional barriers in place when organizing group shows. This obstacle has forced the group to make quick, intuitive conceptual and formal decisions that resulted in new revelations about the artists, the work, and our own curatorial predispositions. We are hopeful that the element of surprise we have imposed on one another translates into excitement among our audience as well. It’s unlikely that any of the selected works would have been shown together had we decided on a different premise for the exhibition. But it’s our hope that their installation together creates unexpected connections. Darren Bader’s work straddles many mediums. It incorporates but is not limited to sculpture, collaborative installations, text pieces, video, and sound. Through the irreverent nature of his output viewers come in contact with outlandish juxtapositions of objects that are playful, humorous, and unlikely to exist without the artist’s intervention. Lauren DiCioccio uses the forms, textures, and gestures of everyday objects as starting points from which to create her soft textile sculptures. The resulting works retain quasi-recognizable shapes, while hinting at more organic and figural appreciations. Aspects of lightness and weight are important to her as she builds these “Familiars”—not quite this and not quite that, but most definitely and very mysteriously familiar. Christopher Dunlap’s paintings engage the viewer through a playful, disruptive exploration of color and pattern. These forms create a multiplicity of relationships between simple shapes and complex structures. Through specific placement, repetition, and implied perspective, the paintings assert a sense of depth. By creating an image that can register spatially in multiple ways, the paintings draw the viewer to a heightened awareness of their own visual processes. This sustained attention seeks to bridge a gap between perception and sensation. These Dolly Greenfield photographs were purchased from a baseball card dealer who had removed them from a photograph album bought at an estate sale. Greenfield, one can assume, did not make these pictures as an artistic gesture, but to record the fact that she met and interacted with baseball players. Greenfield’s lack of intent highlights the charm of the pictures and reflects a nascent celebrity culture where famous people were more likely to be approached by sweet old ladies looking for a memento than paparazzi or people hoping to resell signed memorabilia. Composed of disparate materials brought together as a way of thinking through their material and conceptual connections, the work of Yin Ho maintains the distinctiveness of its components while creating a larger whole. Touch, in particular, evoking in its title a moment that will never occur for the objects of which it is made, manifests the tension in the act of creation, while also emphasizing the charged nature of the space between things. Andrew Ohanesian’s “A.T.M.,” a multiple of three, is precisely the object it appears to be—a functioning automatic teller machine. When a visitor uses the machine to withdraw cash, they receive a custom, unlimited edition receipt signed by the artist for the low cost of $5.99, an act that comments on the commission breakdown structure in commercial galleries. The urban surroundings which camouflage the street ATM are stripped away, and the machine is suddenly isolated and illuminated when reappropriated into the gallery space. Darren Bader (b. Bridgeport, CT, 1978) lives and works in New York. He received a BFA from NYU in 2000. He has had solo exhibitions at Madre, Naples; The Power Station, Dallas; ICA, London; MoMA PS1, New York; among others. He has been included in group exhibitions at the Hammer Museum, Los Angeles; The Whitney Museum of American Art, New York; Palazzo delle Esposizioni, Rome; Palais de Tokyo, Paris and more. In 2013 he was the recipient of the Calder Prize. 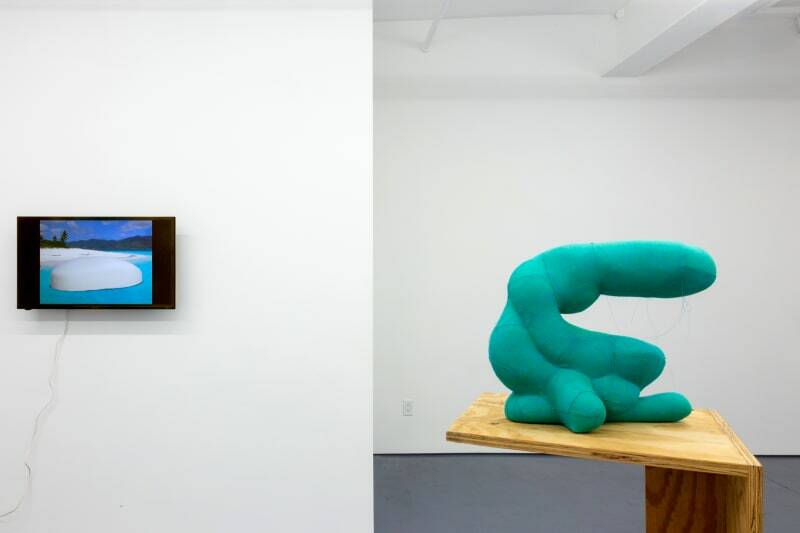 Lauren DiCioccio is a San Francisco-based artist working primarily in the medium of soft sculpture. Her works have been exhibited at such venues as the Yerba Buena Center for the Arts, the San Jose Institute of Contemporary Art, Bellevue Arts Museum (Washington), the Laguna Art Museum (California), and the Boghossian Foundation (Brussels, Belgium). Upcoming exhibitions include a two-person show at Kristin Hjellegjerde Gallery (London) in September and a 2019 solo show at Jack Fischer Gallery (San Francisco). This fall she will participate in the Arts/Industry program at Kohler Co. as an Artist-in-Residence in the cast iron foundry. Christopher Dunlap received his BFA from University of Washington and his MFA from Massachusetts College of Art. Recent exhibitions include Site 131, Dallas; McKenzie Fine Art, NYC; No Place Gallery, Columbus; Sardine Gallery (solo), Brooklyn; Centotto, Brooklyn; Space Available, Brooklyn; Spring Break Art Fair, NYC; Parlour Bushwick, Brooklyn and Es Ef Eff, Brooklyn. Dunlap lives and works in Brooklyn, NY. His work has been reviewed in The New York Times, Two Coats of Paint, Travel Magazine and ArtFcity. Nothing is known about Dolly Greenfield. Numerous google searches have turned up nothing. Yin Ho is a Brooklyn-based artist and writer. Recent shows include Cucumber Skin Jacket, a solo show at Appendix in Columbus, OH, and Science Window, a three-person show at Kayoko Yuki in Tokyo, JP. She has shown at the Torrance Art Museum in Los Angeles, CA, Richmond Center for Visual Arts in Kalamazoo, MI, Denniston Hill in the Catskills, Knockdown Center and Sculpture Space NYC in Queens, NY, and TAON in Paris, FR, among others. She is a graduate of the ITP program at NYU Tisch School of the Arts and the London School of Economics. Andrew Ohanesian was born in 1980 in Laguna Beach, CA and lives and works in Brooklyn, NY. He has been exhibited widely in New York and California and his work has been reviewed in Blouin Artinfo, Hyperallergic, Time Out, Sculpture Magazine, and the Wall Street Journal, amongst others. He received his BFA from the University of California, Berkeley in 2006 and is represented by Pierogi.